The North Florida Parkinson’s Awareness Choir is an opportunity for all members of the Parkinson’s community to raise their voices in song. One of the many symptoms of Parkinson’s is a decrease of vocal quality, as the disease can affect articulation, breath support, and volume. 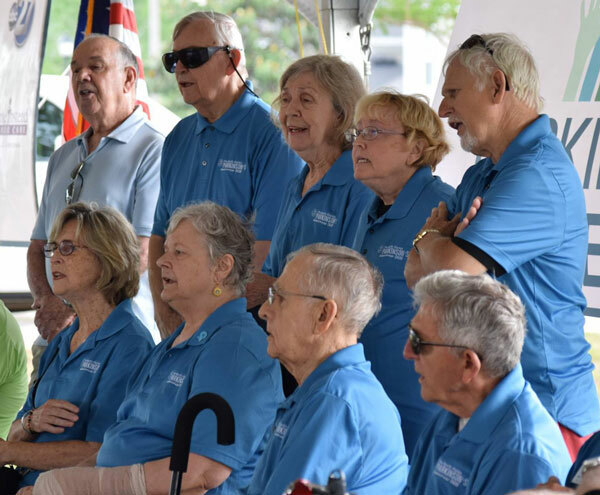 Being a choir member addresses all these factors and provides an opportunity to socialize with those affected by Parkinson’s disease while performing for members of the greater Tallahassee community. Historically, the choir has been led by Tallahassee Memorial Hospital’s Music Therapists as well as interns from Florida State University’s top-rated Music Therapy program. These caring and talented professionals are dedicated to improving the vocal strength, quality, and endurance of people with Parkinson’s. The choir meets every Wednesday from 2 – 3:15 p.m. at Temple Israel in Tallahassee. We are led in vocal exercises at the start of each session, and then we learn a repertoire of eight to 10 songs every three months. Concerts are scheduled throughout the year at residential care facilities, adult day care centers, and other local venues. These events provide a great opportunity to show off the results of our hard work and improve awareness of Parkinson’s disease in our community. The choir is also open to relatives and friends of those with Parkinson’s, and there are no restrictions or auditions needed to become a member. “I have a terrible voice” is no reason to stay away. The truth is simple: The larger our group, the better we sound – and your voice will improve as a result of your participation. Maybe the best reason to join, however, is that we have fun! For further information, please contact the Parkinson’s Outreach Association at (850) 364-0230 or contact@theparkinsonsoutreach.org.